A highly effective and highly affordable promo gift! 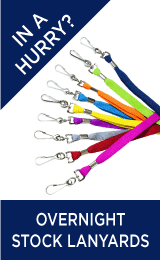 These comfortable lanyards can proudly display your company’s logo in vibrant print for all to see. 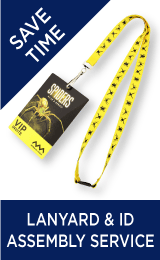 Custom printed lanyards are a great promotional item because they are easily visible. Many companies consider lanyards to be an essential part of their corporate wardrobe, especially when it comes to carrying ID. Your valued team members will appreciate this practical gift, and clients will love using these lanyards and showing off a brand they want to support. Promoting your company in style and comfort has never been so simple, with printed satin applique lanyards! With minimal effort, you can create personalized lanyards and give them away as a company gift to your staff, partners and friends. With that, you are also creating a mobile advertisement for your brand. Satin applique lanyards are subtle yet stylish. They are made with a flat polyester base, with a strip of satin that is sewn in with a colour matched double-stitch. 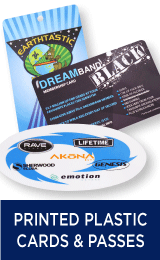 What finishes them off is the sharp screen print of your logo in up to 4 colours. Alternatively we can dye sublimate onto the satin strip, which provides unlimited customization and colours! When choosing satin applique lanyards, it’s important to select an appropriate colour combination. Since the fabric comes in various colours, which can also be custom dyed according to the pantone colour chart, you simply have to choose one that makes your message pop. For instance, if your corporate colours are bright or pastels, then you may benefit from a dark colour or even a completely black base. Choosing the right fitting is equally as important. 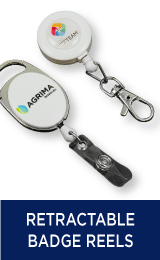 We offer clips, hooks, retractable badge reels and more. Since the satin material is going to be very shiny, you may want a metal hook or clip to complement the lanyard perfectly. 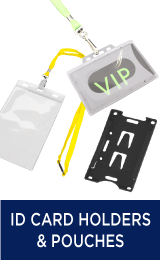 Of course, consulting our professionals to help you get the best look for your satin applique lanyard is another good idea! Because the material is two pieces sewn together, it essentially doubles the lanyard's strength! These are excellent for when a more premium look is necessary, or just when something more substantial has to be worn. People notice quality, so if you're trying to expand on your company's branding or simply looking to get a logo or web address noticed at an event, then satin applique is a great solution! Satin applique lanyards are a practical design that come with the integrated extra style and professionalism that comes associated with high quality material. Perfect for offices, or workspaces where customers will be interacting with staff. First impressions matter – choosing this product helps show the world your company is excelling before a word has been spoken. With a range of clip choices and width options, getting exactly the look you need is easily achievable with Custom Lanyards Canada. Contact us for a no obligation quote and find out today just how affordable luxury can be.